Mention Noosa to anyone who has been there and they will immediately think of Hastings Street. I admit it, I’d fallen into the same trap where each time I visited Noosa I simply headed to Hastings St. After all it’s the home of the beautiful Noosa Beach, trendy shopping precinct and fabulous restaurants, but as I discovered on a recent trip, there is a whole lot more to Noosa than what can be found on Hastings St.
First stop on our 3 day tour of Noosa was the Noosa Farmer’s Markets. 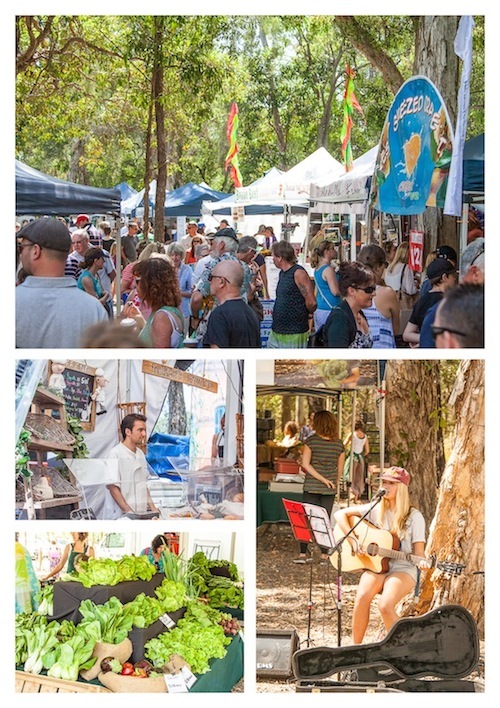 Held every Sunday at the football grounds in Noosaville, stalls are nestled amongst the gum trees and showcase the best of local produce, with everything from fresh fruit and vegetables, vinegars, oils, nuts, cheese and yoghurts, right through to locally made cosmetics. 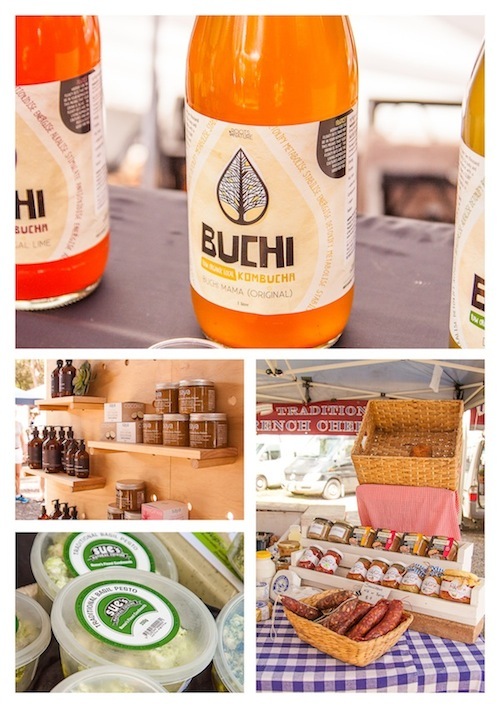 My favourite market finds were Sue’s feta with basil pesto, Buchi kombucha and the French by Nature Salted Butter Caramel, which, let me tell you, is amazing!! After working up an appetite strolling through the markets our next stop was Gympie Terrace. 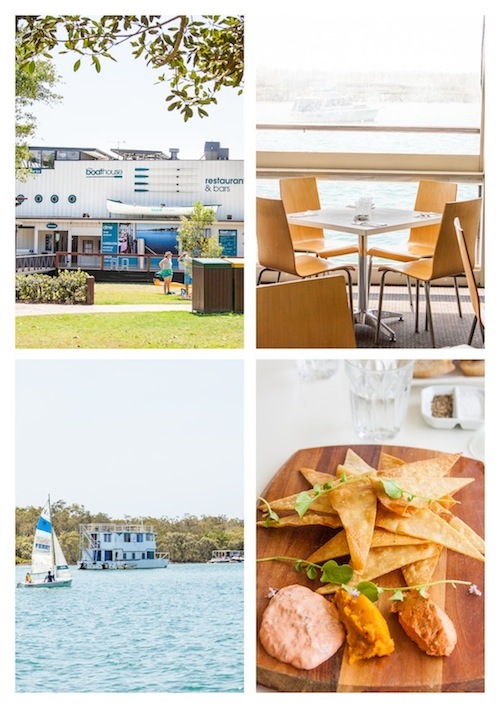 Located along the beautiful Noosa River, and is the home of some fantastic restaurants, a number of boat hire companies, and a shopping precinct offering everything from clothing, knick knacks, books and much more. Our lunch destination was Sirocco. 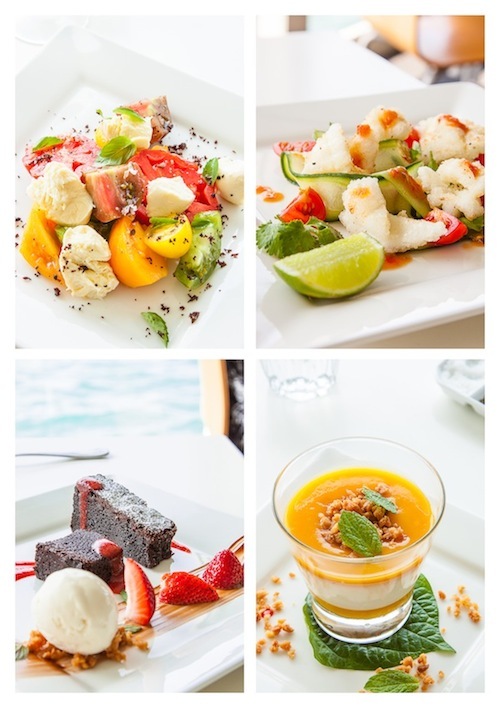 Sirocco offers an extensive menu in a laid back atmosphere with excellent service. One of the things in particular that I loved about Sirocco was it’s extensive range of vegetarian offerings. And if you are a vegetarian you’ll know how wonderful it can be to go to a restaurant and have more than one or two options to choose from. 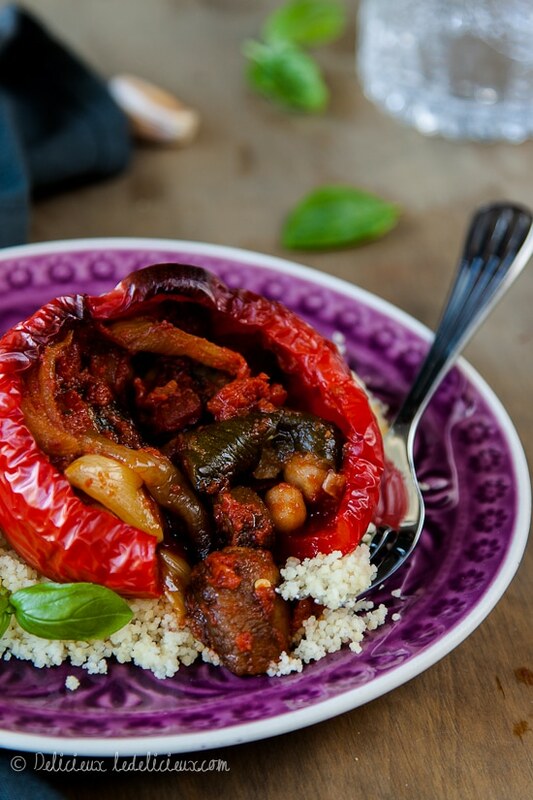 In fact Sirocco offer an extensive and dedicated vegetarian menu. To start with we opted for the herb and parmesan pizza bread accompanied by whipped Persian fetta, green olive tapenade, eggplant zaalouk and roast pumpkin hummus. The pizza was absolutely delicious, being full of flavour from the herbs and parmesan. 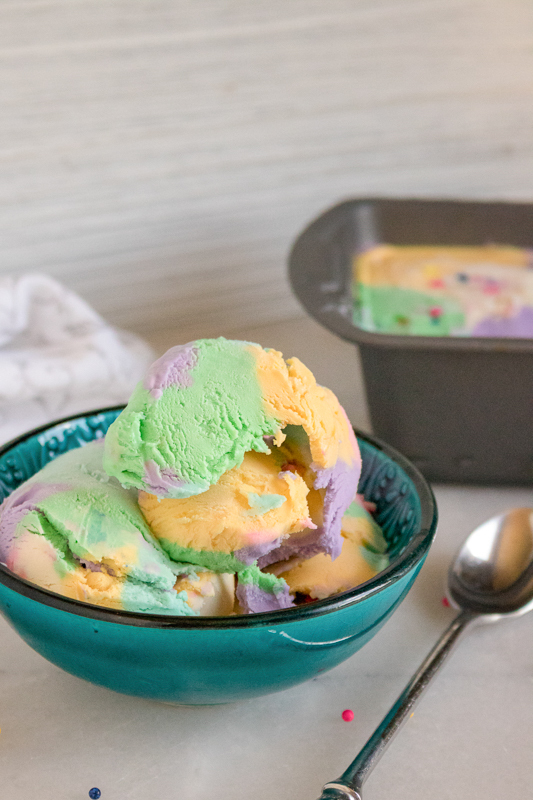 In fact it was so good it’s delicious enough to enjoy on it’s own. 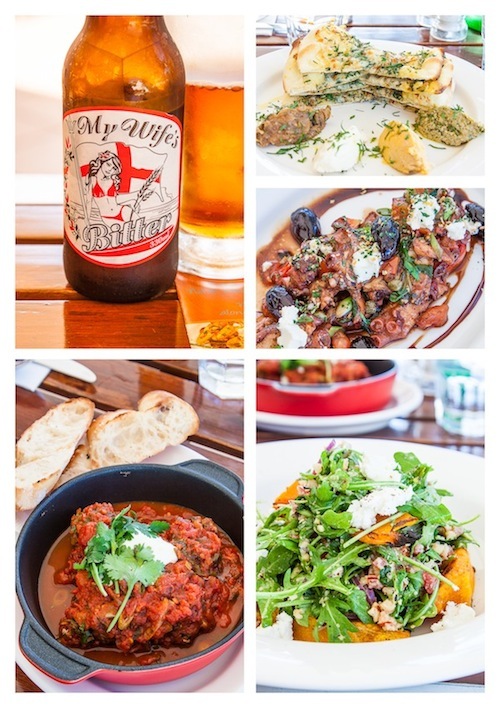 Accompanied with a glass of wine, and a beer, my husband Troy opting for an amusingly named beer called My Wife’s Bitter, it was is the perfect thing to kick off a weekend away, especially given the views of the Noosa River from the terrace at Sirocco. Next up I opted for the salad of roasted pumpkin, rocket, goats cheese, broad beans and toasted hazelnuts. Troy chose two tapas dishes. The first was BBQ Western Australian octopus, Persian fetta, roast balsamic olives, roma tomatoes and preserved lemon gremolata. The second being Moroccan lamb meatballs baked in a spiced tomato sauce, topped with Kenilworth natural yoghurt. Both tapas dishes were generously sized, in fact they were huge, with Troy’s favourite being the Moroccan lamb meatballs, which were also came with bread to sop up the delicious sauce. My salad was, again, generously sized, and packed with delicious roasted pumpkin, hazelnuts, and cheese. We skipped dessert on this occasion, despite being tempted by the honey baked salted dates, yoghurt mousse and pistachio praline, but I know we’ll definitely go back to Sirocco. After lunch it was time for a cruise along the river with Malu-Os. Malu-Os offer luxury small electric boats for hire, and with no boating license needed, it’s an absolutely wonderful, and relaxing way to spend an afternoon. The boats are indeed luxurious, with the Lady Anne, our boat for a couple of hours, seating up to 6 people in comfort. 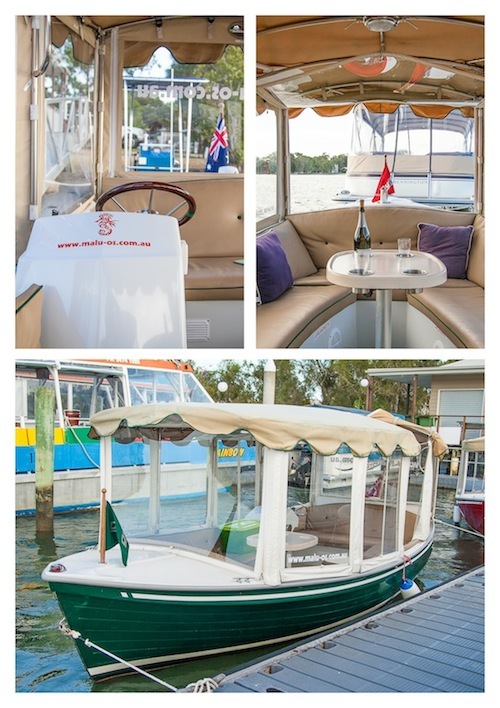 The boats include an esky (which is wonderful if you plan to have a picnic on board), a table with cup holders, and complimentary wine glasses. The cabin of the boat is also protected, however the windows can be opened up so you can immerse yourself in river life. While the boats are self drive, we opted to have owner Kirsty take us out on a cruise to tell us a little more about the boats and the Noosa River. The boats are electric and are absolutely whisper quiet. In fact the boats are so quiet my husband asked whether the boat was on when we hopped in, which, indeed it was. This makes it a fabulous way to cruise the river, because not only are you not polluting the river, the quiet engines mean passengers can engage in conversation without having to shout to be heard. The other benefit is that due to the fact the boat makes no sound you can cruise down the private channels on the river to check out the beautiful waterfront properties without disturbing people. Cruising along the Noosa river in the Lady Anne was one of the highlights of the trip for me. I loved relaxing with a glass of champagne and watching life on the river pass by. In fact Troy and I loved it so much we were back a few weeks later for another cruise, and will be heading back again in a couple of weeks when my parents visit. After a relaxing afternoon on the river it was time to check into our accommodation, the Sebel Resort, which is located in the heart of Hastings Street. The Sebel offers 1 and 2 bedroom apartment style accommodation, which is fantastic for families or couples, offering fully equipped kitchens, with a comfortable combined lounge and dining room. Our dinner destination was Sails. 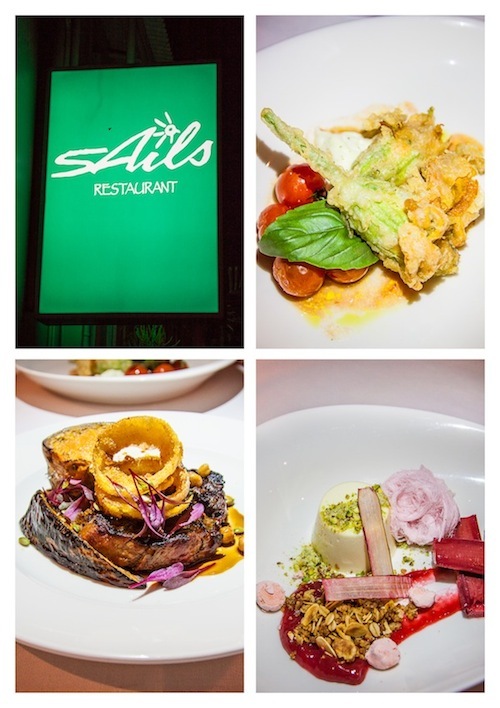 Sails holds a special place in my heart as it was where my husband and I had our wedding reception last year. 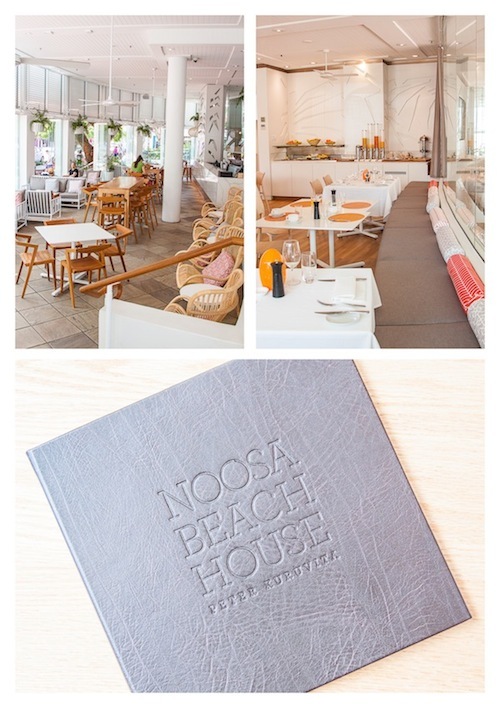 Located right on the Noosa Beach it’s an absolutely beautiful place to enjoy a long lazy lunch while doing some people watching or simply relaxing as you listen to the waves lap on the sand. Heading to Sails for dinner was a novelty as I’d never dined there at night, always opting to dine during daylight hours to make the most of the views. I couldn’t help but order my favourite dish, the tempura zucchini flowers filled with haloumi accompanied by Noosa Reds tomatoes when I discovered it was still on the menu. Troy opted for the chimmichurri basted beef steak with Roast pumpkin, pepitas and buttermilk fried onion rings. For dessert we shared the beautiful wild honey panna cotta with poached rhubarb, meringue, pistachios and Persian fairy floss, which was almost too pretty to eat. The next morning it was time for a trip to Belmondo’s Fresh Food Market, which is the Sunshine Coasts premiere gourmet food destination. Not having heard of it before I was excited to discover it was somewhat like scaled down version of the popular American chain, Whole Foods. 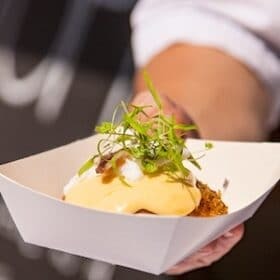 Located in Rene St, Noosaville, Belmondo’s offers a huge range of fresh produce, gourmet foods and ready to food, all lovingly prepared on site. 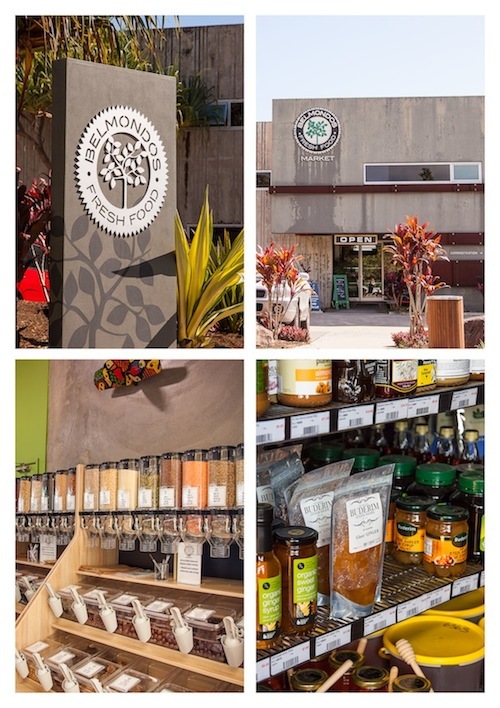 The range of products stock includes well known brands, such as Maggie Beer’s, Herbie’s Spices, as well as locally made produce. 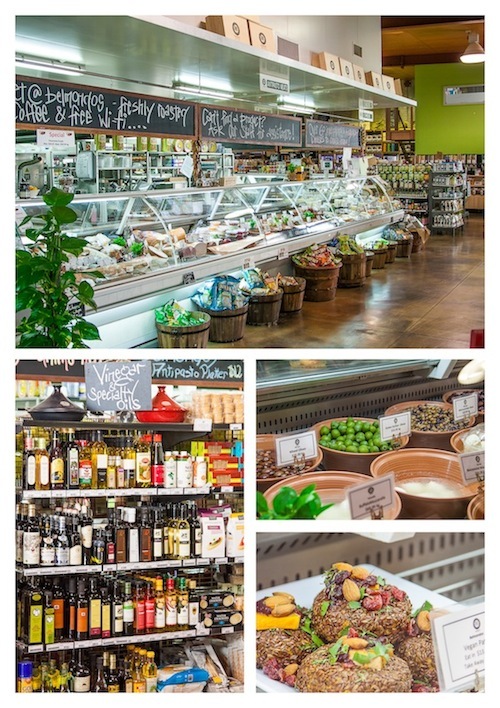 It would be easy to get lost in Belmondo’s for a couple of hours, in fact I almost did, checking out the fantastic range of products ranging from oils, spices, cheeses, cured meats and olives. 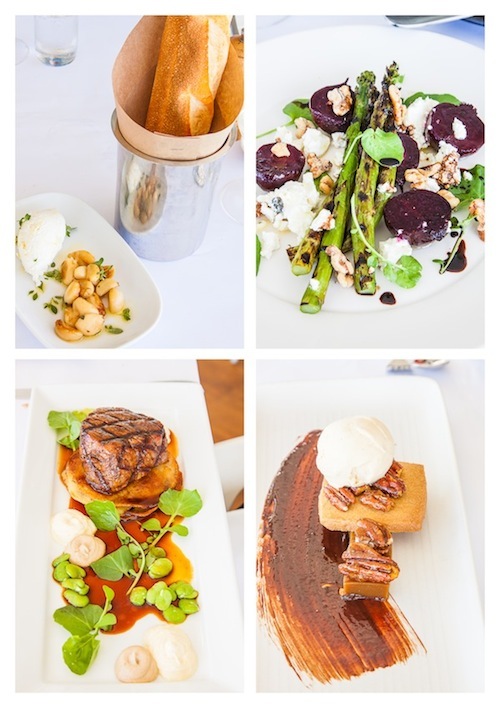 If you are a foodie visiting Noosa Belmondo’s is well worth a visit. Just be aware you won’t be able to leave the store empty handed! 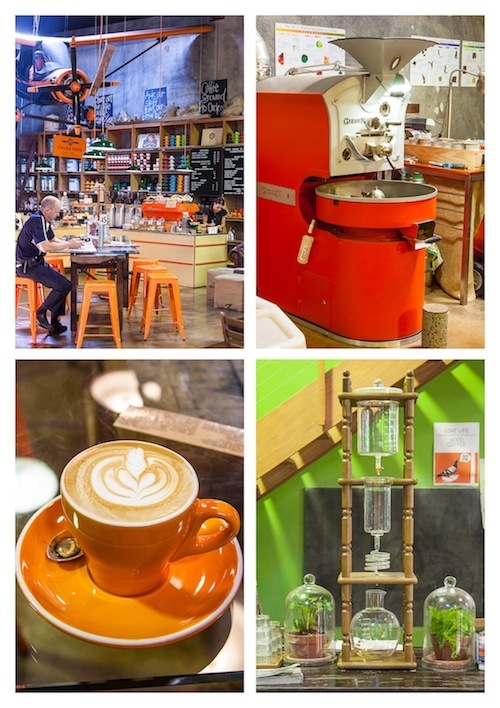 Inside Belmondo’s you’ll also find Clandestino Roasters, which is apparently the location for the best coffee on the Sunshine Coast. Being a tea drinker myself, I had to take my husbands word for it but he agreed it was the best coffee he had in some time. After a morning spent working up an appetite browsing Belmondo’s it was time for lunch at Ricky’s Bar and Restaurant Noosa. 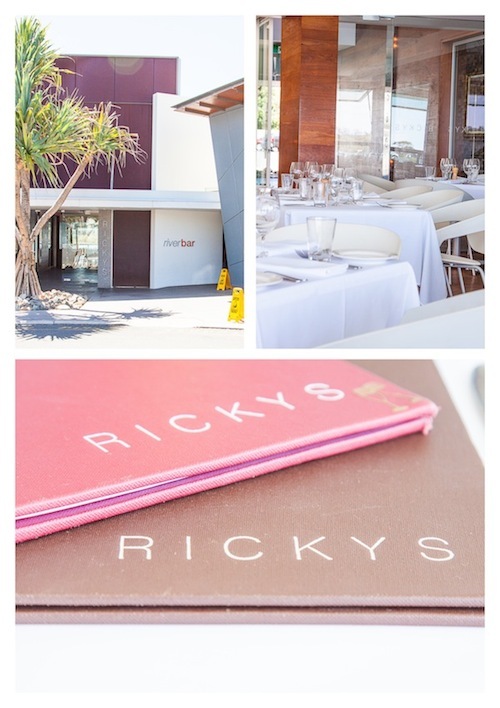 Located at Quamby Place, on the edge of the Noosa River, Ricky’s is another spectacular place to enjoy a meal and watch life on the river go by. 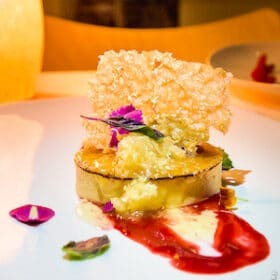 A popular destination for couples getting married in Noosa, Ricky’s is casual but elegant, and the perfect destination for a romantic dinner, which can be ended with a romantic gondola ride which you can join on the jetty outside the restaurant. Troy, unsurprisingly, opted for the beef fillet, which was served on a potato gallette, with broad beans, pine nut puree and horseradish mascarpone cream, which he soon dubbed as the best beef fillet he’s had in a long time. For dessert I went with the deconstructed pecan caramel tart. It looked fantastic on the plate, but, sadly, I don’t think deconstructing this dessert worked for me. It was still delicious, but not, I suspect, as delicious as the original. After lunch we headed back to Hastings St for a walk along the beach, which brought back memories of our wedding day as we made our way along the beachside boardwalk to Sails for our wedding reception. Even if you are not a beach person, which I’m most definitely not, thanks to my Scottish and Irish heritage which leaves me burned to a crisp when I spend more than 10 minutes in the sun, it’s relaxing to sit in the shade and listen to the waves crash on the beach, as well as doing a bit of people watching. 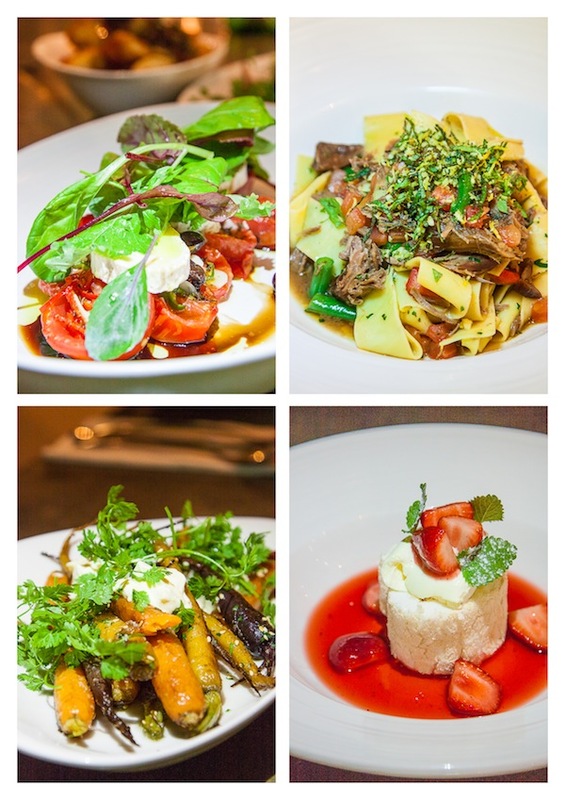 It was back to Gympie Terrace for dinner, to Thomas Corner Eatery, headed up by David Rayner. Thomas Corner Eatery is very unassuming. It’s casual and relaxed, with a lot of tables of families and couples, generously portioned food using great quality produce. 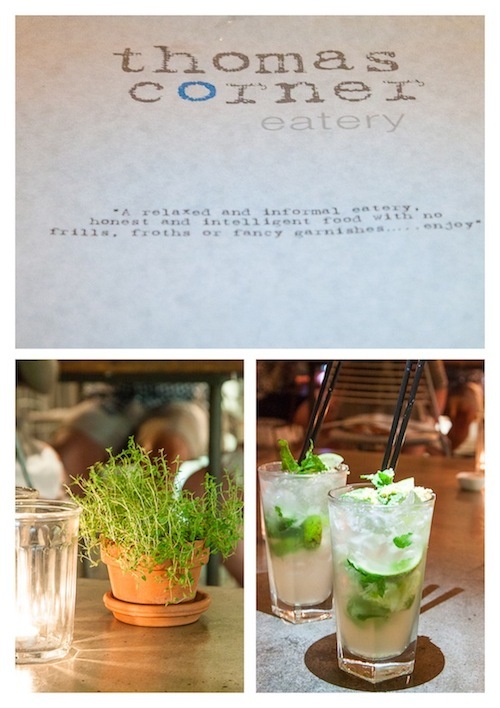 One of the things I loved in particular was the pots of herbs on each of the tables. Maybe it’s just me, but I think herbs are just as beautiful as flowers. The other thing I liked was the hooks on the tables to hang your handbag. No more leaving your bag on the floor for you or waitstaff to trip over. Being fans of mojitos it was difficult to resist the allure of the vanilla and ginger mojito on the cocktail menu, and when our waitress informed us it was the Thomas Corner Eatery’s most popular drink, the deal was sealed. The mojito was deliciously refreshing with a fantastic kick of ginger. I again opted for a starter for my main meal, which was the chili baked vine tomatoes, goat cheese, ligurian olives, capers and olive oil. I was stunned when my dish came out because, for an entree, it was a very generous portion. The tomatoes were amazingly juicy and bursting with flavour, and quickly devoured because tomatoes are one of my absolute favourite foods. Troy opted for the braised lamb shoulder paperdelle, Gympie beans, tomato, rosemary and mint gremolata, which, again, was generously, portioned, although it looked smaller in the bowl than it actually was because it was so filling Troy was unable to eat it all. Troy said the lamb was meltingly soft and he loved the freshly made and perfectly al dente pasta. We also opted to share a side of roasted baby carrots with orange, sesame and yoghurt, which were absolutely divine, as the carrots were so sweet and caramelised, but still had enough structure that they didn’t disintegrate when cut. Again it was simple flavours done well. For dessert we opted to share the Eumundi camerosa strawberry meringue roll, clear strawberry consommé, which our waitress informed us is Thomas Corner Eatery’s most popular dessert. When it arrived I could see why. It was pretty and full of perfectly ripened and plump strawberries. The next morning we had a tour of the Sheraton which recently underwent a $10 million make over. Gone is the iconic pink exterior paint, which I was surprised to discover some were upset about, and in it’s place is a beautiful, relaxing and clean white, which I think adds a clean and relaxed atmosphere. All 176 rooms have been completely renovated, with everything other than the inbuilt spas in each bathroom, being completely replaced. 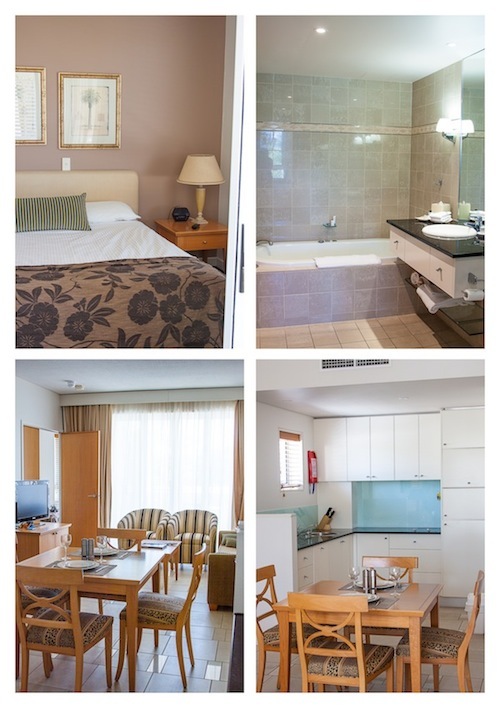 The renovated rooms look clean, fresh, and contemporary, as well as being generously proportioned. 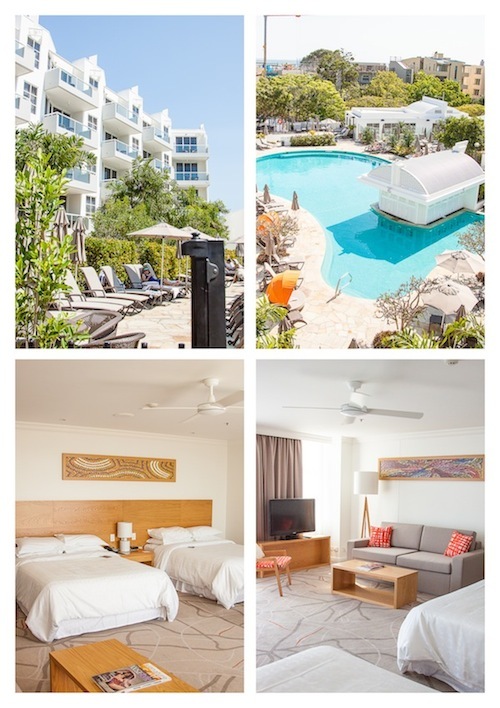 Each room offers either poolside views, with the pool complete with an in built bar, or views of the Noosa river. In addition to the room makeover the Noosa Beach House by Peter Kuruvita replaces the original Cato’s Restaurant & Bar and offers casual place to dine right on Hastings St. With a breakfast buffet offered from 6:30am each morning, a relaxed all day dining menu and a more elegant dinner menu it’s definitely a dinner destination I’ll be visiting next time I’m in Noosa. 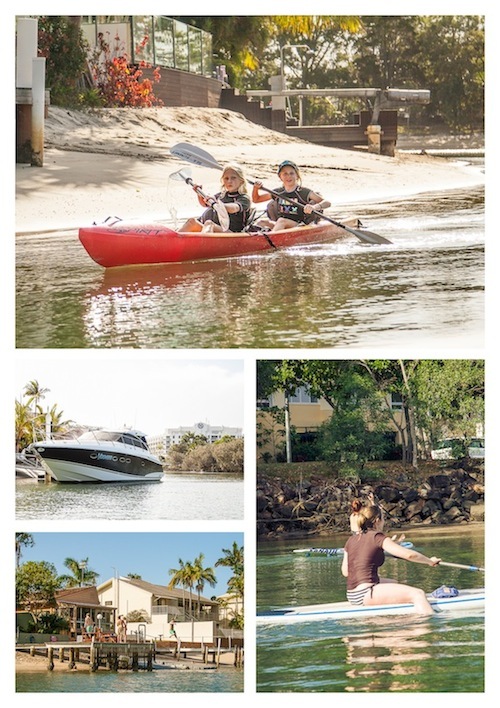 After our tour of the Sheraton we checked out of our hotel and spent the morning strolling along the banks of the Noosa River to work up an appetite for our lunch at the Noosa Boathouse. After 3 days of eating I wasn’t sure how I was going to fit in lunch, but after a long walk, I felt a little more able to tackle the task ahead. It’s a hard life! 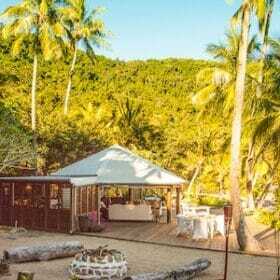 The Noosa Boathouse is located on the Noosa River in Gympie Terrace and headed up by chef Shane Bailey, who previously worked at Berardo’s, also in Noosa. The Boathouse is a hidden treasure, because, as I discovered, it’s unassuming exterior hides some fantastic food inside, not to mention the beautiful views as you sit and enjoy lunch right on top of the water. Browsing the menu it’s clear Shane is passionate about great produce, which was all the more evident when my salad of Steve Waugh’s heirloom tomatoes, marinated bocconcini and olive dust arrived, with Troy’s choice being the salt and pepper calamari. Again it was simple clean flavours that were the highlight. When produce is this good you really don’t need to do much to make it sing. We didn’t need dessert, but after a delicious start we had to try the dessert menu. Troy opted for the chocolate brownie with local strawberry sauce and I chose the mango and vanilla panna cotta with macadamia crumble. I couldn’t finish my silkily smooth panna cotta, but I did eat all the amazing macadamia crumble. If you’re a Noosa regular and haven’t ventured beyond Hasting’s Street I hope this has given you enough incentive to do so. 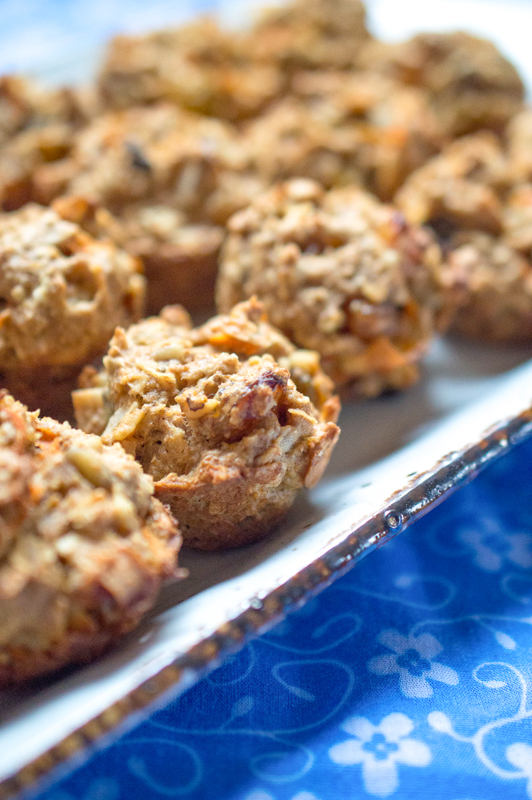 There are so many delicious finds waiting to be discovered. I visited Noosa as a guest of Visit Noosa. As always, all opinions are my own. Such a great round up here, Jennifer. I haven’t been to Noosa for many, many years. 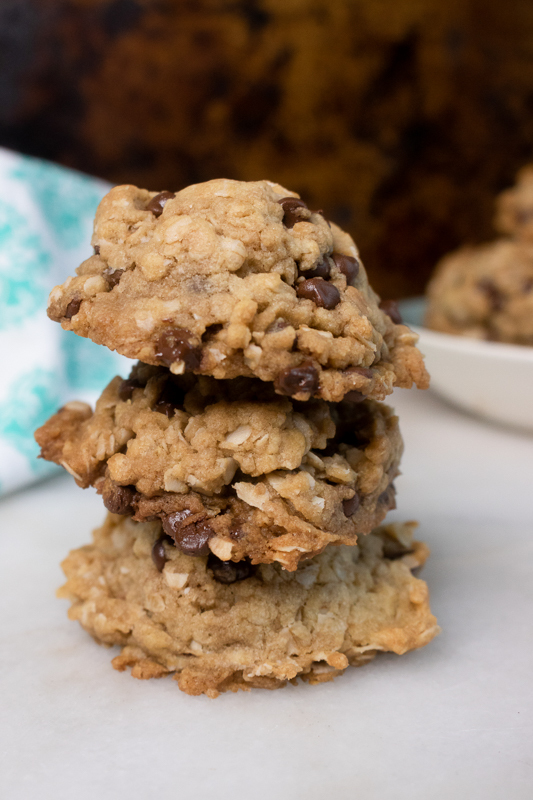 Bookmarking this for when we do visit! 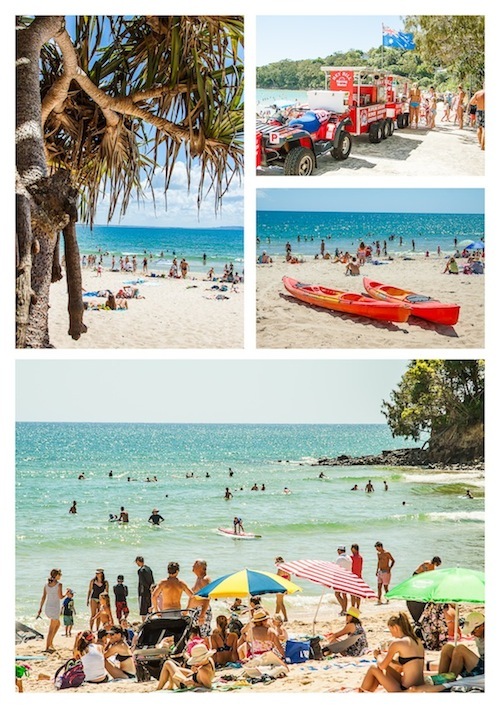 I’ve never been to Noosa, however, I do hope to visit one day, your photos certainly highlight the gorgeous area. I must ask, did you roll home after all that food? hahahaha. And yes, you definitely need to visit Noosa. It’s a gorgeous spot! You’ll love it. Wow – what a comprehensive post with some stunning pictures. I’ve only been to Noosa once & that was so long ago I’ve forgotten all about it, but I’d love chance to try those vanilla & ginger mojito’s. I think you managed to tick off all my favourite spots. I can’t believe I’ve never had the stuffed zucchini flowers at Sails though. I’ve never seen them on the menu. I said exactly the same thing about the dessert at Ricky’s. I think it was more disappointing because I was expecting the traditional version. Yes, the sunshine is pretty spectacular. I just love Noosa. I always feel so calm and relaxed there. 🙂 You’ll definitely need to visit Noosa if you ever come to Australia. I love Siroccos and Sails and omg isn’t the farmer’s market the absolute best in Southeast Queensland? I love it up there. I wish it wasn’t a 30 minute drive or you’d see me there every saturday. I really like Noosa. Whenever we go to Noosa we always head to Hastings St. I honestly didn’t realise how much more there is to Noosa. I can’t wait to head back and explore. The cruise looks fantastic. That’s a definite for the next time. Here’s a crazy story. I lived on the Sunshine Coast for 3 months and have never ever been to Noosa. I have no idea why not. It just never happened. It’s really sad. Isn’t Noosa a gorgeous place? I am so glad to see more of it than Hastings St, it’s definitely time I went back for a better look around. Gorgeous photos as always!